Yesterday I posted a Gluten-free Key Lime Pie recipe, and no sooner did I get the post live, did my loving friends harass me for posting one that I can’t eat myself. Sometimes I feel like my restrictions are hard to follow, and I hesitate sharing recipes which only I can eat because they’re more involved than if you’re just following a gluten-free diet. And since many of you are simply gluten-free, I always want to make sure to offer you some quick and simple alternatives to the gluten-ful counterparts you’ve grown to love. But since I’m not only gluten, dairy and grain free, I’m also egg free, it’s harder for me to find recipes that are quick and easy. Not that I mind; in fact, I’ve grown to love experimenting in the kitchen, and since my son is now old enough to start helping, we’re making it a joint adventure to better health. So in honor of my personal health journey, here’s a version of a KeyLime Pie I can actually eat. It’s inspired by A Dash of Compassion and adapted from a Vegan ‘cheesecake’ that I love from our local Vegan joint in Austin, Beets. In fact, it’s very similar to a recipe I made over Thanksgiving for a pumpkin pie that I could eat. Since I didn’t spend much time prepping in advance, I’ll admit that recipe needs a bit of work, and sadly, I was the only one who seemed to enjoy it. Oh well – back to the drawing board on that one. Don’t worry though- this one won’t last long! Using a food processor, process the almonds/pecans and coconut to a coarse meal. Add the date paste, vanilla and salt and process until well combined. Press the dough evenly into the bottom of an 8-inch springform pan. Set aside. Using a food processor, blend the macadamia nuts, almond/coconut milk, key lime juice, agave nectar and vanilla until smooth and creamy, about 3 to 5 minutes. Pour into the springform pan with the crust. Gently tap the pan on the counter to remove any air bubbles. Place the finished cheesecake in the freezer to set, about 2 hours, or until the middle of the cheesecake is firm to the touch. Decorate with chopped almonds and lime zest before serving. I’ve seen many vegan cheezecake recipes made with cashews, and I’ve myself made them this way. May I ask why did you choose to use macadamia nuts, which are usually quite a bit more expensive than cashew nuts, at least in my little corner of the world. We use macadamia because I’m intolerant to cashews, though you’ve reminded me that I should mention cashews as a replacement. I’m just not sure honestly if it’s a 1 to 1 ratio on the replacement of cashews to macadamia so I’ll have to experiment first! Hi! This recipe is awesome! I just made it with Brazilian nuts instead of macadamia nuts and it tastes great so far…I did have one question. After freezing it for 2 hours should you take out and place and fridge or leave it in the freezer or what? I am making them ahead of time and wanted to know! Thanks for this recipe! I also made the pork chops with apples today and it was fabulous. I am a fellow food sensitive individual and am loving this site! Thank you so much!!! Why oil? What is the coconut oil for and is it necessary? I exclude oils as much s possible from my recipes. What would you substitute oil for? 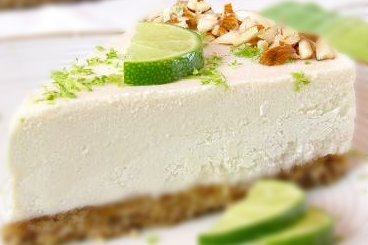 1 Pings/Trackbacks for "Raw Vegan Key Lime “Cheesecake”"
You will find there’s reason people become enslaved drugs. The psychiatric aspect of obsession with drugs can be pretty powerful. Our minds are very complex and the thoughts we have develop into rulers in our existence….